Surrounded by laptops, tablets and smart-phones 24 hours a day can get overwhelming. Never being out of range and always having the ability to access the internet can make you forget the simple pleasures. The boys playing games, as usual. 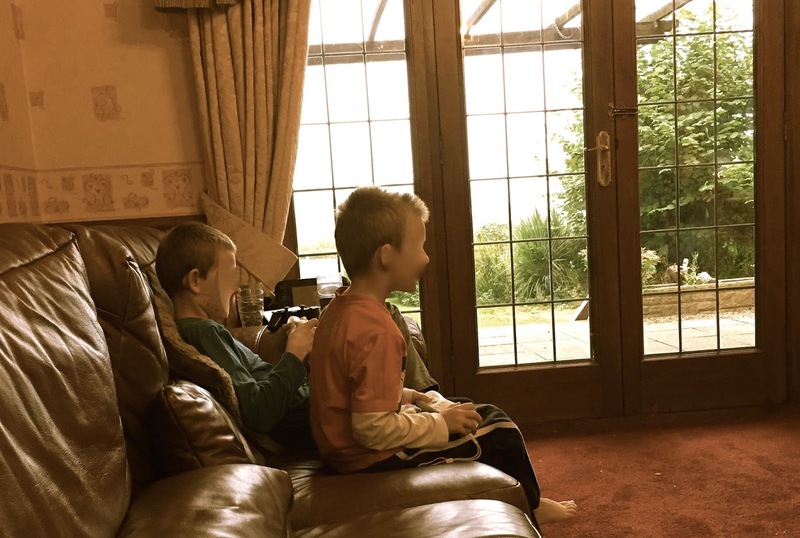 These days children entertain themselves with iPad, Xbox, Playstation, DVDs, Netflix and loads of other technology. They’re bombarded with advertising, whether it be on the TV or iPad, and they always want new things. New Xbox games, new characters for said games, new apps for iPad. My boys rarely ask for new toys, not real toys, like an action man or something. Back in the day I didn't own gaming consoles. No Spectrums and no Commodore 64s. I spent my days sketching and playing with toys, building forts with blankets and cushions, and using my imagination. I make the boys have games-free days, or at least afternoons. It gives them a chance to reconnect with their older toys and remember what they loved about them in the first place. Last week, on one of these games-free afternoons, I built a blanket fort for LP. We used cushions and chairs, a giant blanket and pegs. He loved it. For the rest of the evening he sat inside his fort and played with his toys. At bedtime I had to make sure batman (one of his toys) was on guard, protecting LP’s fort. Watching LP enjoy his fort made me realise that they don’t need technology to enjoy being children. Yes the games are fun but there’s so much more they can do if they use their imaginations. Do you encourage your children to have technology free days? We attempt it but it's not popular. I love it when the kids turn off their technology but it's pretty hard to get them to do it without me nagging!